Fly on the Wall is a monthly post by a group of bloggers challenged to let readers see what it might be like to be a fly on the wall in their homes. Each post is not a single story, but a compilation of snippets, each one its own quote or event or conversation (or disaster) strung together to provide a behind-the-scenes glimpse into the participating bloggers’ lives. On the same day at the same time, all the participating bloggers post their Fly on the Wall submissions and link up to each other. 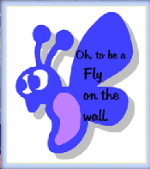 Want to know more about Fly on the Wall? Please click the picture above to take you to Karen Blessing’s blog Baking in a Tornado, the mastermind behind it all!